...I guess you have to give him credit for picking a Rich White Male from a wealthy background. One who like Russel Edson never had to work for a living and coasted through the world on his trustfund inheritance. After all, the Rich deserve to be honored too, don't they. Just ask Louise Glick. Or Richard Howerd. Or Frederick Siedel. A reporter from Excelsior, a Mexico City newspaper, called me the other day. She wanted to know who Ruben Salazar was, why the U.S. Postal Service was issuing a stamp in his honor, and whether it would spark another hissy fit over Mexicans invading America. No, I said, there won't be any such nonsense. Ruben - we called him by first name in East Los Angeles - was a provocative Latino columnist in L.A. during the late 1960s, but he certainly wasn't a militant bent on the reconquista of the Southwest. Aside from former readers and a shrinking group of people who once called themselves Chicanos, most Americans know absolutamente nada about him. He was one of five American journalists honored with first-class stamps Tuesday. 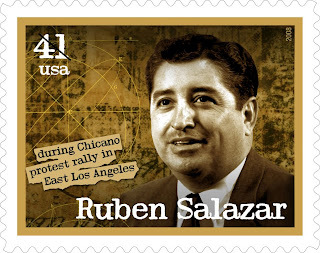 Salazar deserved one because, as a columnist for the Los Angeles Times, he was an immensely strong voice and a martyr for Mexican-Americans searching for political power and cultural identity. He was killed - some still say assassinated - by a tear gas missile fired by a sheriff's deputy during a Chicano anti-war march in 1970. Cue 7 is now ready for purchase. The issue features work by Karla Kelsey, G.C. Waldrep, Michael Schiavo, Ravi Shankar, Barbara Cully, Stephanie Balzer, Mark Horosky, Shelly Taylor, Ann Fine, Jon Thompson, Arianne Zwartjes and a Kora in Hell retrospective by Stephen Cushman. Buy a copy here for $5. Best New Poets is an annual anthology of 50 poems from emerging writers. This year's guest editor is Mark Strand, and he will select 50 poems from from nominations made by literary magazines and writing programs, as well as an Open Internet Competition. All poems are submitted online through ManuscriptHub.com. That system will begin taking entries for Best New Poets 2008 between April 15 and June 5, 2008. Francisco Aragaon talks with María Meléndez on the first audio segment from Latino Poetry Review. The stars will arrive too, and soon, but just as we'd give over to their distant remove and look away, we are turned back again, to a single star, to the setting sun, hailed in a wistful apostrophe: "Iridescent corona, / keep safe your ivory / light." But what is there to keep safe against? Not against the shadow of the turning earth, and not against another cyclical usurpation of darkness. The first poem in a collection provides an entry point for the reader, an invitation into the work. The selection in the number two slot is just as crucial in that it shows your reader (or listener) how you make patterns. "Poets sometimes put poems that are too much alike too close together. I like those chimes to have more of an echo," says Jeffrey Shotts, poetry editor of Graywolf Press. This might be especially important at the beginning of a book; you don't want the contract you've made with the reader to be too tightly written. By putting some space between the most obvious matches, a poet can create even more space for herself to move around in. If only he wrote poetry. Juan Manuel Sánchez, who according to Josh Corey writes "lushly beautiful" poems, told me in an email that my new blog photo makes me look like Capulina. Foul. I guess some straight boys can be as mean as Queens. I like my new author photo. The poster-making people here at Colgate said my old author photo wasn't the right size for the poster they wanted to make for my reading. Right size? Hmm, I forget what was wrong with it. Wrong size! Well, excuse me! Anyways, a student from the communications office came to my office and we took some new pics in the stairwell. But the new photos she sent to the poster people weren't properly formatted or something. So they din't use any of them! But I like them. Granted, it looks like I just woke up in these new pics. Hey, I'm waking to the world. To the beauty. To the terror. I'm waking up to Juan's poems. Gaspar Henaine Pérez (born January 6, 1927 in Chignahuapan, Puebla, Mexico) is a famous comedian who became known across Latin America, under the artistic name of Capulina. He is also known as "The King of White humor". Capulina's father was Lebanese. When Capulina was six years old, he and his family moved to Mexico City. In 1944, Capulina began his acting career. He was also a singer as a teenager, singing for Los Excentricos del Ritmo. Later, he formed part of Los Trincas. Capulina became famous across Latin America alongside his longtime professional partner, Marco Antonio Campos Contreras "Viruta". Together, the two comedians made 26movies. Less than a month left here at Colgate! Linh Dinh on border poetry. Submit now: Pebble Lake Review. A writer I know just got a $9, 000 dollar royalty check for a book published by a university press. I'm going to have to be extra nice to this writer. I clearly owe Gonzalez not only a second look, but an apology. Mr. Selinger, save your empty gestures. My students gave a great reading today. I'm so proud of them. Some were nervous. Some gave all. But all were brave enough to share their work with strangers. Thanks for the recap, Lee. You can pre-order Kate Greenstreet's new chapbook, This Is Why I Hurt You, from Lame House Press. I think that metaphor (and metaphor-making) is a celebration, even while its darker chords might serve as a dirge—but don't both celebrations and dirges characterize our existence? The poem celebrates and mourns our awareness of mortality and our (desperate) attempts to feel alive and even immortal during our scant minutes of joy and beauty. like an overcoat tossed upon the ocean. a golden oriole prays for rain. I had a great time reading yesterday. I was a bit nervous, but I got over it quickly. The room was packed. English department folk. Current and past students. Students from other creative writing courses. 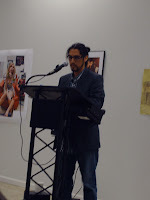 David Eye, a third-year MFA student at Syracuse, was kind enough to drive down to come hear me read. It was a pleasure meeting him. This was the first time I've ever read in front of students. I mean students from my classes. It was a bit strange. I felt like I was exposing myself a bit too much. Bruce Smith paid me a high compliement: he wrote down some of my lines/ images down on a piece of paper. I do that too. But I have to be blown away to do that. Speaking of my students. My class will be giving a poetry reading at the Colgate bookstore next Tuesday. I took the class photo last week. My name is misspelled on the bookstore web page: Educardo Corral. After the reading a group of us headed off to a nice dinner. I had the sea bass. Very tasty. The boys in my class love the work of Terrance Hayes. MiPoesias May 2008 features recipes, photographs, and, of course, poems. Tayari Jones has organized an e-bay auction to raise funds for the mother and son attacked in Dunbar Village. I had dinner tonight with one of the new Colgate fellows. Oh, you didn't hear? Starting this fall Colgate will award two fellowships each year. I'm going to miss Colgate. And Hamilton. I've had such an amazing time here. I know I don't blog about it much. But believe me. I finished my first book here. I started my second book here. I know I'm a very lucky poet. I will be living in Lewisburg, Pennsylvania next fall. Looks like a nice small town. I'm giving a reading at Colgate this Tuesday. I'm going to miss my office! But never fear! I get a new office in the fall. My Smurfette figurine will shine on another desk. The new installment of Pistola is up. It features Bob Hicok, Xochiquetzal Candelaria, Diana Park, and Alberto Rios. Got to order this book ASAP. I love it when Ivy blogs about her days at colonies. On Saturday I read at the Virginia Festival of the Book in Charlottesville, the town where I grew up. My mother said she wouldn't miss it, though I suggested it might be too much for her to go. It was strange but sweet to be standing up in front of her. She’s 91, and I am sure she was secretly terrified that I would embarrass her. I was a terrified, too. She sat there in her wheel chair, in the middle of the room, the sun on her white hair, looking amazed. Afterwards, she wanted me to read the poems for her again in the privacy of her own room. Then she had me mark off all the poems I had read. She particularly liked the poems about herself. Yes, she would say, nodding. Yes. That sounds like me. This narrative is a part of the family of the imperialist writings of Theodore Roosevelt, and Frederick Jackson Turner, and the formation of the American Man through the taming and civilizing of the Wild and Dark (pigmented skin, unenlightened), childlike superstitious Other. What is obviously troubling to me is this I white center versus black brown other existing marginally and only in relation to that I white center pervasive cosmology’s refusal to die out and become irrelevant, or pointedly criticized by American literary institutions. "I think a greater part of my shock about Mission Work comes from my knowledge of its author’s prior/continued engagement with a somewhat visible group of Asian American poets in NYC. In addition to the above final questions posed by Barbara Jane, Id like to submit the following: how do you reconcile the Aaron Baker known in the past to be a generous, if not generative, presence for/amongst said group of Asian American poets, with the colonialist & primitivist author of the newly-released Mission Work?" "...weddings, in any culture, are major life events. but look at how baker characterizes the chimbu wedding: he only focuses on the 'primitive' killing of pigs (newsflash to mr baker, you gotta kill the pigs to eat the pigs, nothing real exotic 'bout it.). this primitizing caricature of an indigenous wedding is insulting. the rest of the poem reiterates the paternalistic tone as baker directs his white readers to see / learn from the lessons he learned as a missionary son. apparently, baker has access to a special indigenous knowledge that he wants to share with 'you'." I found out late last week that I've been awarded the Philip Roth Residence in Creative Writing at Bucknell University. I will be given housing, an office and a stipend. And four months to write and write! I can't wait to enjoy the readings the Stadler Poetry Center will host in the fall. More later. I'm off to teach.